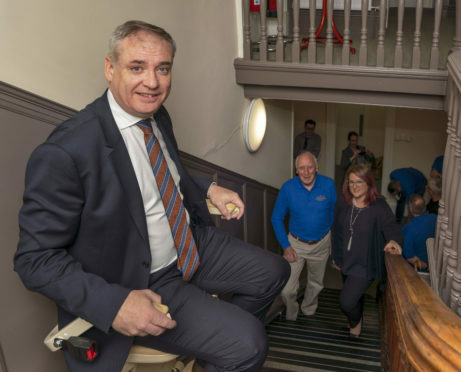 MSP Richard Lochhead uses the seat lift to negotiate the stairs watched by David Thow, Chairman of Fochabers Mens Shed and Morven Smith, Head of Community Investment SSE Plc. The Fochabers Men’s Shed has become a cherished part of the Moray community. And now, it has been completely refurbished to allow for easier accessibility to men facing social isolation in the town. The installation of a stairlift at the Fochabers Institute should guarantee that members who struggle with mobility issues will now feel more welcome. Fochabers Men’s Shed chairman Dave Thow said yesterday he was pleased the facility had received a significant upgrade. He added: “Before the refurbishment, this place was a shambles – it was basically just a snooker room with a huge snooker table and it became a dumping ground for everything. “When the hall in the institute was renovated, we moved out as well and decided it was time to get the place sorted and make it how we want it. “So we’ve got seperate rooms for the leather work, the wood work and the lounge area. “The stairlift definitely makes it more accessible, we had two of the guys spending six months out in the shed because they couldn’t get upstairs, so they felt a bit out of it. The shed is open to everyone over the age of 18 and despite its name, women are also welcome, with the 37-strong membership including two females. It is a place for socialising, but also gives people a chance to learn a new skill, such as woodworking or using a computer or tablet. The group works in partnership with Milne’s High School and helps them make various wooden products, including bird feeders. Money used in the refurbishment came from the SSE Beatrice windfarm fund. Moray MSP Richard Lochhead was a special guest at the shed and cut the ribbon to officially re-open the site before speaking about the importance of the group to the community. He said: “The Men’s Shed movements offers huge benefits to local communities. “It’s an opportunity for people to come together and get active and to also give back to the local community, given the skills that the members have for making and mending things. “Of course, it’s also an opportunity to have camaraderie and time in the company of new friends.